Chetty communities living in the core area of Mudumalai Tiger Reserve have been demanding that they be shifted out of the forest for three decades. Why is the forest department delaying their rehabilitation? Krishnan chetty, 75, is no longer at ease in the heart of the dense forest and in the midst of wildlife. “We have been living here for generations,” he says, showing rani patta, or title deed given by the British for his six-hectare farm in Benne village, located in the core area of Mudumalai Tiger Reserve. 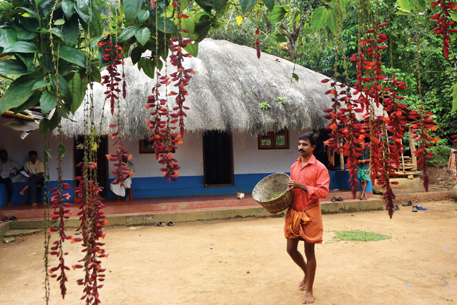 He earns a living by growing pepper, coffee, paddy and vegetables. “Lately, life has become stifling in here,” he says. Any question about resettling outside the forest infuriates him. It’s not that he is unwilling to abandon his home or farm. On the contrary, for three decades, Krishnan and others from his Chetty community from seven villages in the core area of Mudumalai, have been asking the government to resettle them outside the forest. “But the authorities have been dragging their feet over their demand. They are delaying the relocation process despite an order from the Madras High Court,” says B Srinivasan, president of Mudumalai Rehabilitation Committee, a people’s forum. The court in 2007 ordered the state to relocate the residents within a year by providing them land, equal to what they would lose during relocation, and other facilities. “Instead, the government upgraded the protection status of Mudumalai from wildlife sanctuary to tiger reserve and then to a critical tiger habitat,” Srinivasan adds (see ‘Life in a tiger hot spot’) The judgement came in response to a petition by Srinivasan’s father, M Balakrishnan, leader of Mountadan Chetty community (see ‘To relocate or not’). He filed the petition in 1998 on behalf of the seven villages in Nellakotta and Mudumalai gram panchayats (see ‘Appeals dismissed’). He passed away two years ago after having waited in vain for government to act. Explaining their desperation to move out of the reserve, K C Sukumaran, resident of Kolli hamlet in Benne, says, “After declaring Mudumalai a wildlife sanctuary, the forest department imposed various forest and wildlife protection laws, which hindered our free movement and blocked development works, including maintenance of houses and roads and preparation of land for cultivation.” The villages do not have basic facilities like electricity, healthcare, higher education and transport. “We have to walk for kilometres through the wilderness for almost everything, from going to schools to hospitals to shops. Though there are primary schools in a few hamlets, they are hardly visited by teachers due to lack of transport facilities,” he adds. Spanning 32,100 hectares,Mudumalai National Park in the Western Ghats is home to elephants, leopards and 48 tigers. It is also a haven for several vulnerable and endangered species. Declared a tiger reserve in 2007, it is part of the Nilgiri Biosphere, a biodiversity hot spot, and is contiguous with Nagarhole and Bandipur National Parks in Karnataka, and Wayanad Wildlife Sanctuary in Kerala. National parks in the region and their adjoining reserve forests support 8,000 elephants, the largest group of elephants in the country. The number of wild animals has increased following increased protection. While this is good for the biodiversity, says N K Gopalan, a resident of Benne, they now frequently raid and damage the crops. “It seems the forest department is trying to smoke us out by delaying resettlement,” alleges S Sivaprakash of Muduguli village. “Relocation in Mudumalai is a unique case,” says P M Muthanna of Wildlife Conservation Society-India Program, a non-profit in Bengaluru that supports voluntary relocation projects. The process of relocation from a tiger reserve or a wildlife sanctuary is usually initiated by the forest department and faces stiff opposition from people. But the resettlement process in Mudumalai is being driven by a petition filed by people and a court order favouring them. Yet there is little progress in the matter, he points out. The authorities have no answer for this inordinate delay. Activists, however, blame it on the ineffective forest department. “The officials have little understanding about relocation processes. The lack of coordination between the forest and the revenue officials delayed the land identification process,” says Muthanna. 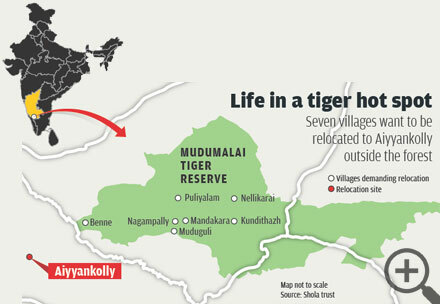 The SEVEN villages inside Mudumalai Tiger Reserve are inhabited by four communities. A majority of them belong to Mountadan Chetty and Mountadan Chetty communities and practise farming. The others belong to landless tribal communities of Kattunayakar and Paniya who work for the Chettys or as forest watchers and anti-poaching squad members under the forest department. While the Chetty communities have been demanding that they be rehabilitated outside the tiger reserve, only one tribal has applied for relocation. Instead, about 90 tribals from Mudumalai panchayat and 40 from Benne village have applied for title deeds for forestland under the Forest Rights Act (FRA), 2006. The process of recognising their rights is yet to be completed. Some Kattunayakar tribals told Down To Earth that they would not leave the forest, while many Paniyas said that they would like to relocate for Rs 10 lakh as compensation, and that they have informed the forest officials about their intention. "Here, we get Rs 150 to 250 a day. 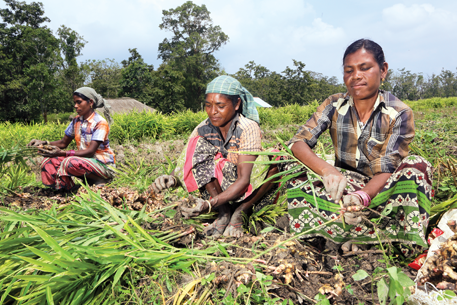 We will get higher wages outside the forest," says Kannan, a Paniya youth. It's illegal if tribals are pressured to leave the villages without settling their rights under FRA, says M Suresh, a Moundadan Chetty youth, who works for non-profit Action for Community Organisation, Rehabilitation and Development in Gudalur. Consider this. When the legal battle began, the forest department looked for land to resettle people. Since no revenue land was available in Gudalurtaluk where the villages are located, the forest department identified 480 hectares of degraded forestland at Aiyyankolly village in the adjacent Panthalurtaluk, 30 km from the reserve. For speedy implementation of the rehabilitation process, the state government in 2007 established a district-level committee, with the district collector as chairperson and the wildlife warden of Mudumalai sanctuary as the member secretary. But it took the officials three years for preparing the list of 449 beneficiaries. Worse, after receiving the list in 2010, the National Tiger Conservation Authority (NTCA) accepted the claims of only 19 of the 20 beneficiaries who had opted for Rs 10 lakh cash compensation. NTCA rejected the list of the remaining beneficiaries—368 families that had opted for land-in-lieu-of-land scheme and 61 did not opt for any benefit—saying that the list was prepared without complying with its guidelines, which says those above 18, unmarried daughters, widows and physically and mentally challenged persons within a family should be considered as separate families and be given cash compensation. NTCA asked the authorities to prepare a fresh list of the beneficiaries. In another instance, the authorities initiated land survey of the relocation site for the seven villages in 2011. “Chetty people helped the authorities in the survey by removing the undergrowth and laying stones along the boundary. On most days, they could not return to their villages and camped out in the open,” says H Madhusudanan, conservationist who co-ordinated the survey. Despite this the officials took nine months to complete the survey which could have been completed in a couple of weeks, he adds. Besides, all the work has gone in vain. Without the final list of the beneficiaries, they could not demarcate or allocate land to anyone. Forest has regrown at the relocation site, and the survey will have to be done again, he adds. By December 31, 2013, the authorities received a fresh list of 800-odd beneficiaries, but are yet to finalise the list or prepare master plan for relocation. Says K Sukumaran, who gives legal aid to the Chettycommunities, the district-level committee has held several meetings with the representatives of the communities and non-profits in the past two years. Frequent transfer of top level district, forest and revenue officials has hindered the rehabilitation process. Five district collectors, four field directors of the tiger reserve and four revenue divisional officers have taken charge since the court order in 2007. “Every time an official joins, they raise new issues on rehabilitation, and the process goes back to square one,” he adds. The officials of Mudumalai could have taken lessons from other successful relocation projects. At Bhadra Tiger Reserve in Karnataka, 460 families were relocated within three years. At Wayanad in Kerala, 150 families have been relocated since 2010. At Nagarhole National Park in Mysore, relocation is taking place in a phased manner. “Had there been a master plan with all details of each person, the process would have been faster and efficient. But the authorities seem directionless,” says S Jayachandran of non-profit Tamil Nadu Green Movement. Tarsh Thekaekara of Shola Trust, a Gudalur-based non-profit, points out another problem. The forest department does not have a dedicated team to implement rehabilitation projects. He says the department can create a “relocation sub-division” exclusively for this purpose, headed by an assistant conservator of forest. Repeated attempts to contact Nilgiri district collector R Sankar to obtain comments on the allegations against the authorities did not yield result. Chief wildlife warden Raghuram Singh and deputy director T Chandran were reluctant to speak about the rehabilitation process. “The resettlement plan is being implemented phase by phase. We are now finalising the list,” was all that Chandran had to say. C Vijaya Babu, the newly appointed revenue divisional officer of Gudalur, also refused to divulge more details. Says Thekaekara, speedy implementation of relocation in Mudumalai will not only ensure social justice to the residents but also help consolidate the largest block of elephants and tiger habitat in southern India. Good article summarising a long and complicated issue! Nice photos as well. 1. On the map, the position of Gundithal/Gundithazh and Nellikarai is wrong. Nellikarai is just the near the border and Gundithal is outside. To the best of my knowledge, neither are part of the relocation plan. 2. Kattunayakar is a different SC community, the people you are talking about is Kattunayakan. And M Suresh who works with ACCORD is bettakurumba, not chetty. 3. A tiger reserve consists of a core zone (or critical tiger habitat) and buffer zone. For Mudumalai the TR and CTH were both declared in December 2007, and I think till date there is no buffer zone. Ajit Menon and Daniel Taghioff have a good article in EPW about the complications around this. 3. Dr. Raghuram Singh is the Field Director and Chief Conservator of forests, not Chief Wildlife Warden. Through this article, M.Chitra has brought out the true story of the sons of the soil in Gudalur Taluk. They are merely surviving due to the grace of god, fighting all kinds of wild animals and forest department. Though they are demanding just rehabilitation for the past many decades, the process is being taken long time only due to the irresponsible and inactive bureaucracy. thanks a lot for the author, M.Chitra and for the Down to Earth, for bring out the truth. it will definitely boost the morale of the people inside the Mudumalai Tiger Reserve, who are unheard hitherto. Thanks for bringing out our plight to the outside world. I hope your well written article will open the eyes of government officers. Guntithal and Nellikarai are both in the MTR and are demanding for Rehabilitation. Infact I am from Gundithal and am one of the ardent seeker of rehabilitation only due to the hostile forest department and wild animals. thank you very much for all hardwork done by you. Thanks to Down to Earth, which is as usual always with the poor and downtrodden. Thanks a lot for publishing our news in the Down to Earth Magazine. Though we are demanding rehabilitation for the past many years, no one is bothered to publish our pathetic condition except you. Thanks a lot for bringing out a well studied article about our plight inside Mudumalai Tiger Reserve. At last I could see some news about us in Down To Earth. I hope the authorities will look into it and expedite the matter of our rehabilitation. Thanks a lot for the article in Down To Earth about our condition in Mudumalai Tiger Reserve. Thank you for taking all the trouble and bringing out our news about the need for speedy rehabilitation. Like all families languishing in here, I also hope the government will speed up the matter of our rehabilitation and resettlement. Subramani, Nagambally, Mudumalai, The Nilgiris.